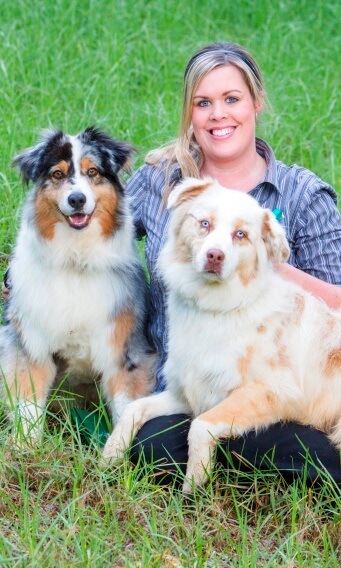 Amanda, pictured here with her dogs Mya and Dakota, has been working at Eltham Veterinary Practice since 2006. She has been the Head Veterinary Nurse now for a few years, having finished her Certificate 4 in Veterinary Nursing at Box Hill Tafe. Amanda has had a big year, becoming married to long time partner Brenton and building a house in Kinglake. You need a house on 8acres when you have three horses, three dogs and a cat! Her three stunning horses; Nixi, Cookie and Jordy, are all Australian Quarter Horses. Amanda’s interests range from horse riding with her three horses to being a fanatical Richmond Football Club supporter. 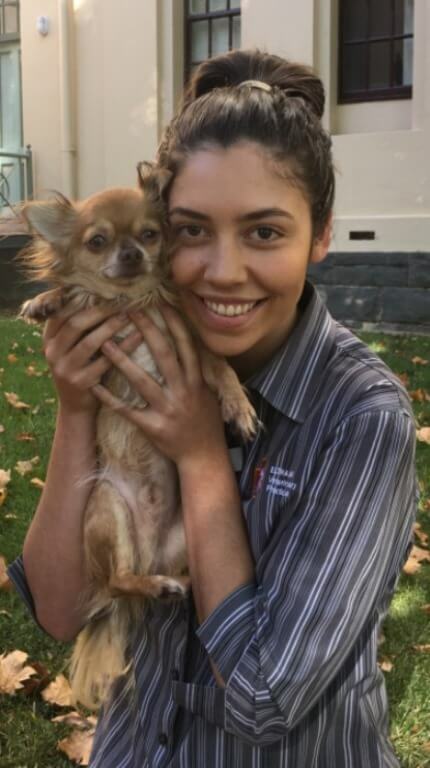 Amanda loves many aspects of her job, and in particular she says: ‘you can’t beat the satisfaction of seeing a pet back to health and reunited with its owners after a long hospital stay for a severe illness’. She also loves getting to know all our clients and pets, and enjoys giving professional advice that will improve pets lives. We first met Hannah in 2005 when she came and did year 10 work experience with us. She was impressive then, and when she came to us about a job recently, we were equally impressed. In the interim, Hannah finished her year 12 certificate with flying colours, and went on to study at University. After completing a four year Bachelor of Environmental Science degree, Hannah thought she would soon find her ideal work. Three years down the track, and no closer to workplace satisfaction, she decided to see if her early instincts were actually right. 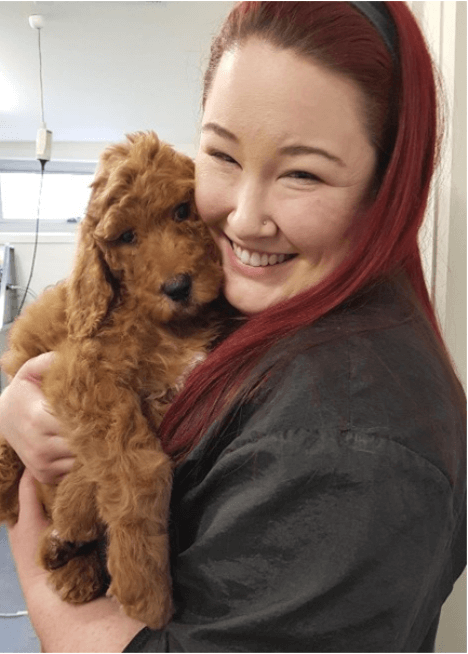 The staff at Eltham Veterinary Practice will testify that Hannah really appears to have found her niche and so will all the pets she takes care of. When she’s not caring for pets, you can find Hannah at the gym or watching a good movie and if the “Tiges” have a win, you can be sure she will have a big smile on her face on a Monday. 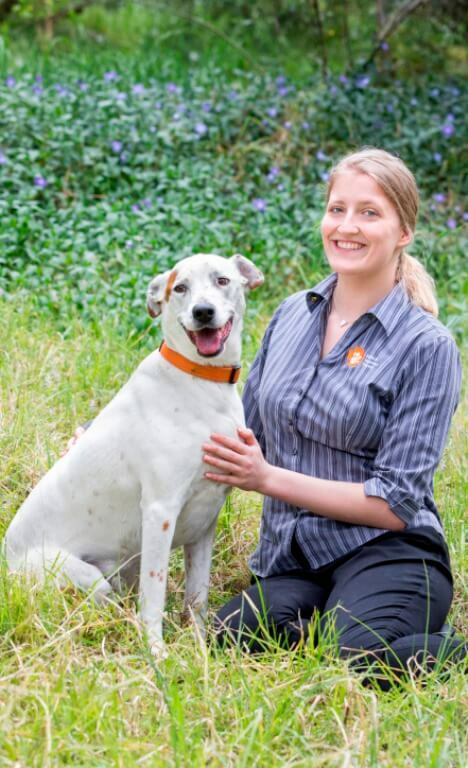 Karly joined Eltham Veterinary Practice in October 2015 and has quickly settled into the role of receptionist. With over 7 years experience working in retail as a department manager at Toys R Us at Chadstone she is no stranger to the customer service industry. She has always had an interest in studying animal behaviour and working in the animal industry. She has successfully completed a Bachelor of Science at Monash University majoring in Zoology. She currently has five pets, Tom the Beaglier (pictured) and Mily a Maltese Shitzu as well as 3 cats Tig, Kitty and Molly. In her spare time Karly plays mixed Basketball with a local team and will often be found at the MCG during the footy season cheering on the Melbourne Demons. Nicki has been in the industry for a couple of years, having previously worked as a Canine Rehabilitation Assistant. She is now very excited to complete her Certificate IV in Veterinary Nursing at Eltham Vet. With a love for anything outdoors, depending on the season you will find Nikki on the slopes snowboarding or down the river water skiing. She also likes to spend her weekends camping and four wheel driving and is a big fan of country music. The Border Collie pictured above with Nicki is her 9 month old beautiful boy named Stewie. She also has a playful cat named Pepper, who is 2 years old. Be sure to give Nicki a warm welcome the next time you’re in the practice! Renee joined the team back in October 2013 as our receptionist but when the position for Office Manager became available in January 2016 it was an obvious transition into the new role for Renee as she is highly organised with great attention to detail. 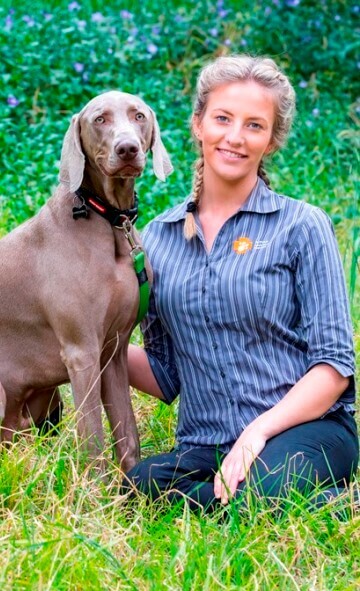 She comes to us from another industry, previously in a role as a personal assistant for 5 years locally in Eltham for an electrical contractor; and she is loving the change to the animal industry. She’s our resident crazy cat lover with her two purrfect kitties, 20yo Princess Lilly and her boy with “cattitude” Bryan! Renee’s pup nephew Jasper is featured in her staff photo as her cats were being less than cooperative on the day. Outside of work Renee spends her time with friends, family and long-time partner Jake. She enjoys Mexican food, group gym sessions, going to the movies and she’s a bit of a TV series fanatic! Renee will spend her very last dollar on live music, having seen an impressive 70+ shows and like most females is a shopaholic! Renee would also say she has the travel bug, having travelled America 3 times most recently in October 2016 – with Europe in her sights for next year! 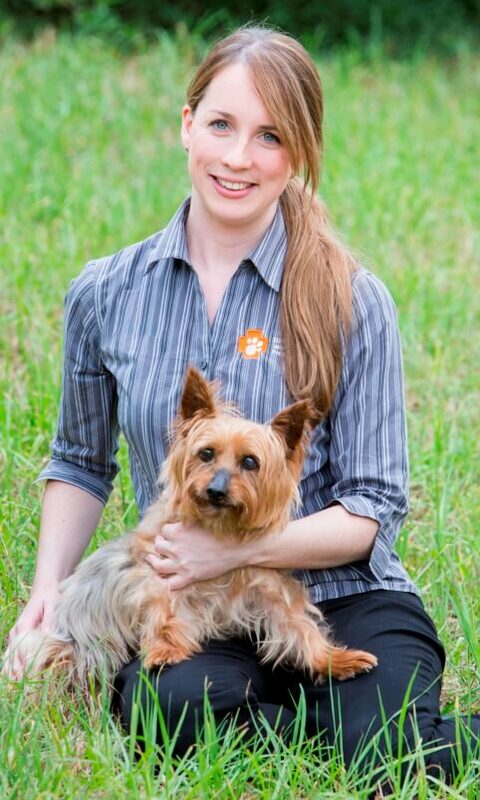 Since starting at Eltham Vet Rene’e has made a delightful impression on clients and staff alike, as her cheerful personality has a way of brightening your day! If you have a pet insurance query or you’re just after a chat pop into the practice! Aimee joined the team in March 2017. 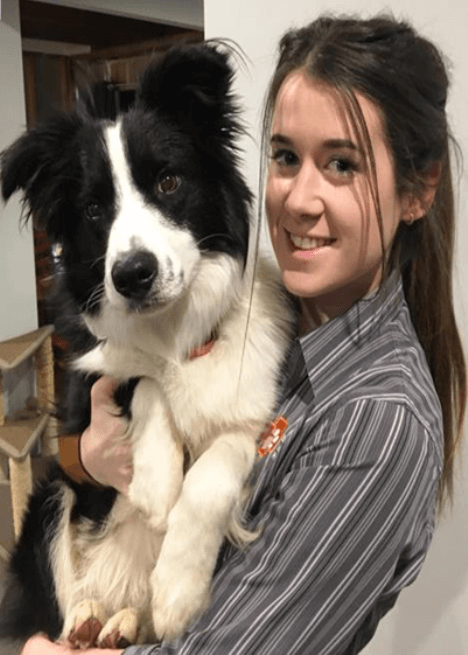 Having over eight years experience working in customer service, Aimee has come from being receptionist in Collingwood – where her favourite activity was dog spotting through the window and befriending the local staffies! It’s safe to say she has found her new home with us an easy one to settle into! Having owned many different animals in the past, she is currently mum to Jax (pictured with her), who came into the family after being abandoned when he was a few months old. When she’s not answering your questions or saying hello to your furry friends, she can be found baking in kitchen, camping around Victoria or watching the mighty Richmond Tiges with her family! With a passion for writing, Aimee completed a Bachelor of Journalism which she will be putting to good use on our website. Emily joined our team in May of 2017. It’s not the first time Emily has been part of our team though! 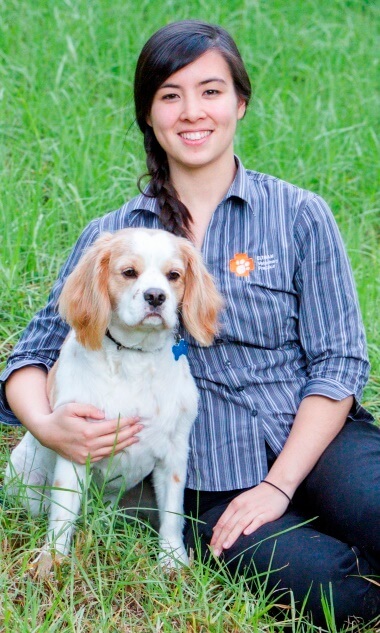 Back in 2014 Emily worked with us as part of her weekly placement while completing certificate 3 in companion animal studies during year 12. Since then Emily has been studying a Bachelor of Business, majoring in Economics. She has also been working locally at the Bolton Street Pet Store for the past 2 years, so some of you may recognise her friendly face! Emily enjoys travel, with Bali being her favourite destination and in her spare time she loves going to the beach and catching up on her favourite Netflix shows. She’s the proud pooch mother of her Weimaraner named Hugo and pictured below is Kikki the Vizsla, she also has a sassy kitty named Bella! 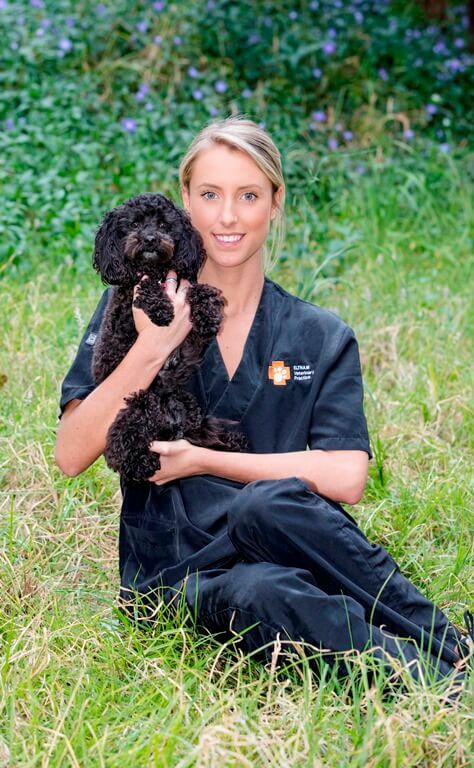 Be sure to say ‘Hi!’ Emily at your next appointment, we’re sure that her bubbly nature will brighten your visit to Eltham Vet. Deb has been with us on and off since 2004, whilst having two boys since then. Deb has passed her love of travel onto her boys and they love to go on family trips whenever possible – Disneyland was a big hit! She is a huge animal lover and our dedicate cat lady – having 2 cats that are almost 16 years old! They were strays who were abandoned at only 3 weeks of age, but have been spoilt ever since. Since then, the cats have been joined by 2 guinea pigs and a Pomeranian cross Shih Tzu named Darcy (pictured above!). On the weekends Deb can be found barracking for her beloved Collingwood and in the off season, pottering in the garden…unless it’s too hot which then means shes in front of the aircon with a good book. 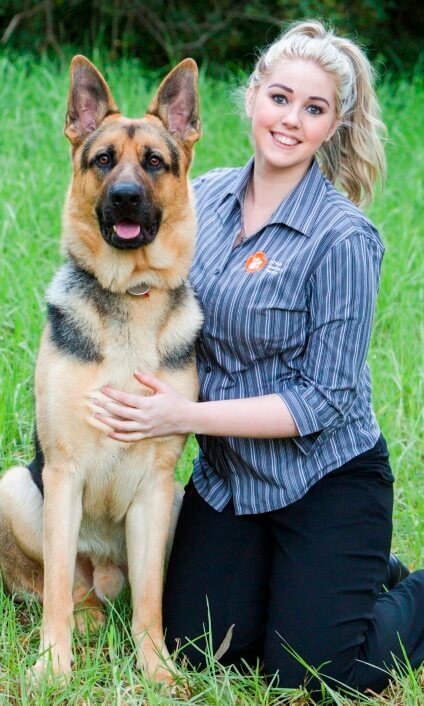 Introducing the newest member of the Eltham Vet team, Romme! With a love for travel, Romme has seen Japan and Peru and last year spent extensive time in South East Asia travelling to Thailand, Cambodia and Vietnam. She is now planning her next trip to Central America, with plans to visit Mexico, Belize, Guatemala, Costa Rica and Panama. In her spare time Romme likes catch up with friends, read and watch her favourite Netflix shows. The gorgeous little Chihuahua pictured below is her 4 year old named Morris and she also has a lovely 7 year old Ragdoll cat named Harley. Be sure to give Romme a warm welcome the next time you’re in the practice. Siggy has been with us since October 2016, training with our old groomer Annette after completing her Certificate 3 in Pet Grooming. 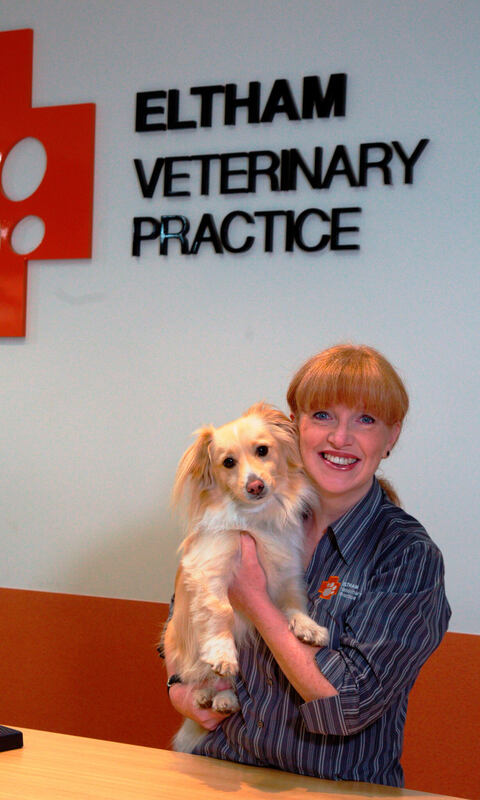 If you’re a regular at Eltham Vet, you may have seen this friendly face around the practice. Chances are if your dog has been groomed here in the last few years, Siggy had a major part in that service! Siggy loves getting away to her parents house near the beach and catching up with friends when not at work. You’ll find her working Monday – Friday for all of your pet’s grooming needs! Jess joined our grooming team in October of 2017. After years of working in hospitality and event management Jess decided she needed a career change to find something she was truly passionate about. She began a dog grooming course in 2017 and fell in love with the job instantly. Since then she has been assisting Siggy upstairs with all of our grooms and providing extra cuddles free of charge! She has three dogs; 2 miniature schnauzers (Sunny and Daisy) and a Maltese x (Zara). Jess is also a musician! She sings in a cover band most weekends, and she also plays guitar and piano.